Raising Awareness of ovarian cancer symptoms is important YEAR-ROUND. And in September we turn up the heat! There are many ways YOU can help Raise Awareness every day and save a life. Create a ripple effect by sharing awareness messages with your friends and family members via E-Mail, Facebook and Twitter. Follow this link for ideas and some great (PDF) messages you can share. And share those selfies! We want to see you wearing your teal! Use the hashtag #WearTealDay and tag @ColoradoOvarianCancerAlliance on Facebook and @COCAorg on Twitter! Share your pictures on your own FB page, share them on COCA's page or email them to Jeanene@Colo-ovariancancer.org and we'll post them for you. Be sure to follow COCA on Facebook and Twitter! Sharing COCA symptom cards is one of the best ways to raise awareness. Cards include symptom and risk factors AND what the next steps are should symptoms persist. Here are suggestions for using cards and posters to get the word out at work and school. It's easy to reach out to your community! -Start with your church or synagogue. -Take posters and symptom cards to your local coffee shop or merchant. -Leave a symptom card when you tip your waitress. We have ideas and materials so you can raise awareness where you live. TURN UP THE TEAL at home and in your neighborhood with yard signs and teal tree ribbons! Be sure to ask your neighbors, family, and friends to do the same! 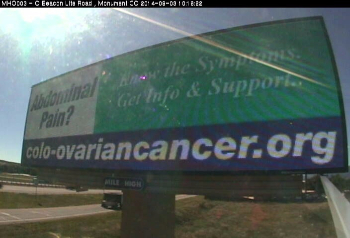 Thanks to Mike Napolilli and the team at Mile High Outdoor Advertising, COCA is spreading the word about ovarian cancer symptoms throughout Colorado during September via a HUGE digital billboards! Check them out starting September 1st at I-25 at Douglas County county line, I-25 near Monument, I-25 and 104th, I-270 and I-76, and two locations in Grand Junction. What a fantastic way to raise awareness!